*Do I have to go to a Chiropractor for the rest of my life? *Can Headaches Be Helped With Chiropractic? *I'm Pregnant, Can I Be Adjusted? *Am I Too Old For Chiropractic? *Digital, state of the art, Radiology on site. *What if Something is Broken? This is the fancy word Chiropractors use to describe a joint that is subtly misaligned and not moving properly. This happens more often than you would think, and especially in the spine where there are 96 joints! The more research that is done, Doctors are learning more and more that it is the lack of normal movement, or improper function of the joint that is the larger part of the story. Old Chiropractors would tell their patients that a bone is out of place. Now days, we not longer say that. When we are adjusting your joints, we are restoring better function to your body. Think of a subluxation as a “sticky” and “stuck” joint and you’ll have a better, more accurate idea of what it is we are correcting. Subluxation, by themselves can cause feeling of stiffness and pain. Unfortunately spinal subluxations also usually cause nerve irritations in the subluxated area. This can cause weird feeling of pins and needles, numbness, itching, or burning pain in the area of the subluxation or further down the path of that nerve. Another side effect of these subluxations are that these irritated nerves cause the muscles in the local area to go into spasm, this causes localized pain and perpetuates the subluxation by not allowing the vertebrae to function properly. If that wasn’t enough, subluxations can also, sometimes, cause larger problems. If that irritated nerve goes to an organ, it is possible that that organ may not function properly. Chiropractors should not claim to treat organ problems (ulcer, indigestion, sinus infection, ear infection, menstrual cramping, heart palpitations, erection dysfunction, infertility…just to name a few), but Chiropractors have occasionally seen these the problems get better with Chiropractic adjustments. I like to think of them as possible, positive, side-effects. Do I have to go to a Chiropractor for the rest of my life? This is a common Chiropractic Myth. You do not have to continue beyond any of your own goals. There is research to support the idea of continued maintenance care and many people do see Dr Sanford for “tune-ups” because they have found the value in such, but you are in charge of your own body. You get to make the decisions. I do tell people is that subluxations just happen in life, they happen when we strain or hurt ourselves, maintain poor postures, get stressed, don’t exercise properly or enough, or even eat the wrong foods. So seeing a Chiropractor once in while is very, very common and extremely helpful! Dr. Sanford strongly believes that if you have a Chiropractic problem, that you should see results by the third visit. That is not to say that everyone is “cured” in three treatments, but you should certainly be improving by then. If not, he will re-examine the area, consider taking X-rays (on-site!) or consider referring to another health care provider. 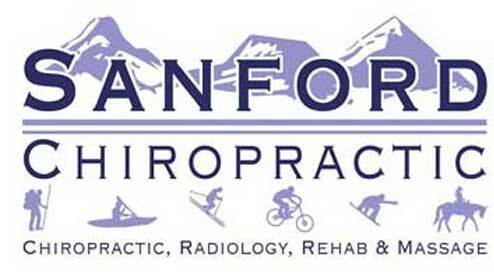 Rest assured that when you see Dr. Sanford you will not be “sold” on Chiropractic, nor asked to sign up for any extended, expensive “three times a week for the next six month” treatment plans. Can Headaches Be Helped With Chiropractic? Headaches are one of the easiest things to treat and it's a pleasure to bring relief so quickly in many cases. Headaches are often, but not always, the result of neck or back muscular tension or joints moving in a limited manner long enough that the surrounding muscles spasm. Chiropractic can often help immediately both with acute or chronic headaches. I'm Pregnant, Can I Be Adjusted? Expectant mothers can indeed be adjusted. A good Chiropractic Physician will of course do an examination to be sure that an adjustment is safe for the circumstance or the discomfort in question. 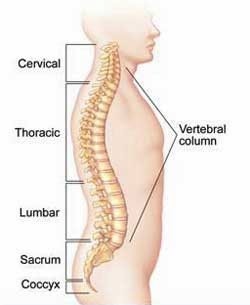 A spine that must accommodate increasing weight can indeed suffer and Chiropractic can often help. Anything that restores healthy circulation is also good for the baby. Stress felt by difficult or worrisome pregnancies can also be alleviated. Dr. Sanford often treats what he calls "New Baby Back " and that's the pain and rigidity that results when a new mother spends so much time looking down at her new baby as it nurses, she develops some pretty significant pain in her neck and back. Ouch! Very fixable with Chiropractic and Dr. Sanford will go a step further and assist the patient with better ways to sit, to use pillows and adjust the way the baby nurses to prevent the condition in the future. Am I Too Old For Chiropractic? No one is too old, but once again, a careful exam can determine if there is any risk. There is no state or national statute, or requirement that says everyone needs to have an X-ray to be adjusted. This is simply not true. Chiropractors are taught, over many years, how to carefully palpate (feel) for joint restrictions and subtle misalignments (called Subluxations) in your spine. A good Chiropractor does not need an X-ray to see these. Truth is, most of your spine’s problems cannot be seen on X-ray anyway, especially since the larger issue regarding your spine is how it is functioning/ moving; and of course, an X-ray tells you nothing about that. Dr. Sanford will ask to X-ray the area of concern if there is a history of recent trauma, something unique to your history that raises concern of infection or tumor, if he feels something really unusual with his hands, but the most common use of X-ray is if we don’t get the expected results with treatment. Digital, state of the art, Radiology on site. 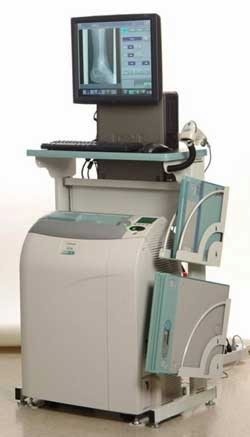 Dr. Sanford takes all his own X-rays using a new, state of the art, digital processor. He is very picky about the quality of these radiographs. Know that these X-rays are as good as any other facility, and will be appreciated as quality by any other health care professional. You can also think of Sanford Chiropractic as an inexpensive emergency room when you are wondering if you may have fractured or broken a bone after a fall or accident. Dr. Sanford is qualified to take and read X-rays for any part of the body. If a fracture is found, we will refer you directly to an orthopedist for treatment, by-passing the ER entirely. Better yet, if there is no fracture, Dr. Sanford can provide conservative treatment and advice that will speed the healing process. He works closely with many PTs in town as well. Dr. Sanford has years of experience evaluating and diagnosing patients. If after an exam, he determines that a bone might be broken, he will recommend an X-ray which can be taken on the premises in the same office. Many families use Sanford Chiropractic as a first line of defense for the sport-loving families. An X-ray from Sanford Chiropractic is a fast way to find out if Junior indeed broke his wrist or just sprained it. If the bone is broken, Dr. Sanford can immediately send out the digital x-ray to the patient's physician of choice for splinting or casting. If the bone is not broken, Dr. Sanford can often perform or recommend treatment himself. Normally, an adjustment does not hurt. Part of the reason for this is that Dr. Sanford uses massage to loosen up the afflicted area before an adjustment. An adjustment can be "surprising," a word patients often use. Occasionally, fluid trapped between tissues can make a sound when it is released. Rarely, an adjustment can be painful as circulation rushes into previously "locked" joints or joints may not move as easily as expected. 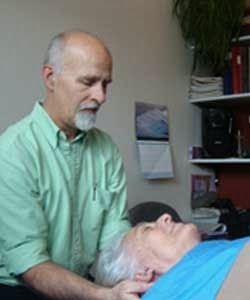 Almost always, patients feel relieved after an adjustment. Rarely, but it happens, Dr. Sanford might feel an area is too "acute" or swollen for adjusting. He might recommend addressing the inflammation first. Chinese medicine has had the philosophy for centuries that children are the most important patients of all. Circulation, mobility and healthy movement are required for proper growth and development. Just like in adults, an injury or some joint stress can get in the way or normal movement. But in a developing body, this can be serious and it can have life-long consequences or cause chronic pain that could have been avoided. In the case of a child, an adjustment is usually painless and quick to ease the discomfort in question. Children love to be adjusted and Dr. Sanford has a special "horse" adjusting table that makes kids happy.